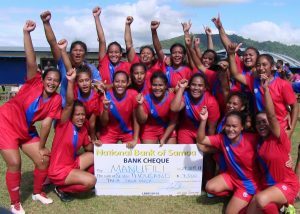 Samoa Football > News > Samoa Cup > Samoa Cup officially kicks off! After a 5 year absence, the Football Federation Samoa is reintroducing the Samoa Cup. 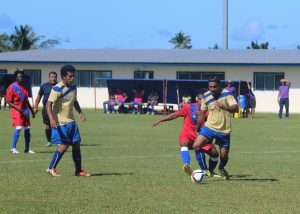 The Cup competition pits the best and brightest Samoa has to offer in the week long football competition. In years past selection teams from New Zealand and American Samoa have participated but due to the long layoff this year’s tournament will feature only 5 teams (Men & Women), which are made up from 20 Upolu and 10 Savaii clubs that are currently part of the Samoa National League. The four teams in Upolu are made up from 20 registered clubs while the Savaii team is formed from its 10 clubs. The Competition started with an opening prayer conducted by Rev Faitoaga Tolua whilst Associate Minister Honourable Alaiasa Sepulona Moananu delivers the Keynote address on behalf of the Government of Samoa. The National League has been on hold for the last two weeks to allow the 5 representative teams’ team to train and prepare for the tournament. FFS President Rev. Laupama Solomona stated that an important element to this tournament was not only the opportunity to review the abilities of the players but also to review the capabilities of each team’s management team. The competition is being supported through the assistance of the FIFA FORWARD project which has allowed the Federation to provide all participating teams (10) with new uniforms, $2,000 each for training costs, organisation costs and prize money that will be split between the participating clubs for club development purposes. Match days will be on Monday, Wednesday, Friday, and Saturday. Entrance is free to the public. Next PostCup competition, a great success!